What exactly is the Inner Line Permit, and why is the issue so sensitive? People take out a cycle rally in Imphal East district on Tuesday demanding for Inner Line Permit System in Manipur. On Tuesday, fresh clashes erupted between two groups over the Inner Line Permit issue in Manipur. For the past several months, the state has been wrangling with mass protests for implementing the Inner Line Permit. While a 13-member all-party committee was formed in 2014 to look into the demand of various social organisations for introduction of the Inner Line Permit (ILP), not much progress has taken place. The Joint Committee on Inner Line Permit System (JCILPS) has been spearheading the agitation, and many people have gone on an indefinite fast, defying repeatedly imposed curfews. Inner Line Permit (ILP) is an official travel document issued by the Government of India to allow travel of an Indian citizen into a protected area for a limited period. It is obligatory for Indian citizens from outside certain states, to obtain such a permit. ILP is a British era document. This provision was made by Britishers under an Act called as the Bengal Frontier Provision Act, 1873. But it is still used in independent India to protect tribal cultures of the North East. At present, the ILP is in force in Arunachal Pradesh, Mizoram and Nagaland. In Manipur, large scale protests have called for its implementation for years. Under the ILP system, a certificate can be issued to outsiders only for travel in the areas covered by ILP. A non-resident also cannot buy property in these areas. Long term residence however, is allowed under certain kinds of ILP. Such provisions though are not valid for Central government employees and security personnel. In 2012, the Manipur state assembly passed a resolution urging the Government of India, to implement the ILP system in Manipur. The Manipur Assembly introduced the Manipur Regulation of Visitors, Tenants and Migrant Workers Bill this year, but it was withdrawn on July 15 because the JCILPS felt it protected immigrants more than native Manipuris. There is no ILP in Manipur because Manipur was never under British rule. In 1949, the King of Manipur signed a document merging the region with the Indian Union. Before 1949, Manipur was a sovereign state with an elected government. The argument of JCILPS is that since Manipur can no longer protect its indigenous culture and distinctiveness after the 1949 merger, the ILP system must be put in place. 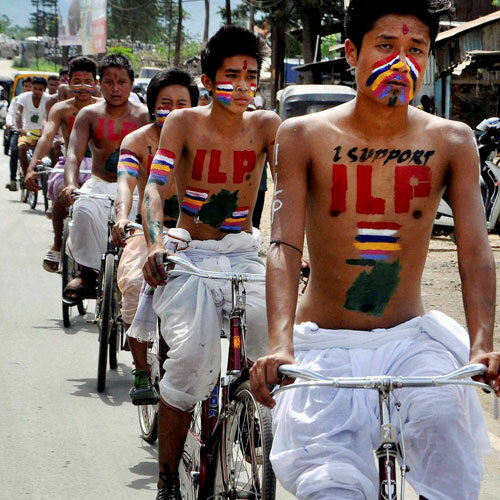 The free entry of 'outsiders' both from within and outside the Indian state is a central cause for the demand for ILP. Some believe that absence of a permit system can make indigenous communities in Manipur a 'minority', both culturally and demographically. ILP proponents assert that after independence and subsequent accession of Manipur to India, the influx of foreigners and other Indians into Manipur has increased exponentially. Illegal immigration from Bangladesh, Burma and Nepal has also gone up. This has led to increased competition for employment opportunities among other things. Local youth have to compete with outsiders for jobs. Moreover, outsiders are often ready to work for lower wages. ILP advocates also say that Manipur had not acceded to the Indian Union when the Constitution was drafted, and hence it had no say in the framing of the Constitution. Many advocates thus support constitutional amendment to make the ILP system possible. Proponents also argue that since Arunachal Pradesh, Mizoram and Nagaland, which have similar indigenous cultures and problems post independence, have implemented ILP, Manipur should also be included in the system. Furthermore, most political parties in Manipur and outside, support the implementation of ILP. The BJP has very strongly demanded its implementation for the past few months, after being opposed to it for a long time. Regional parties in Manipur mostly support the ILP, and although the Congress did not take a strong stand on the issue in its 2012 election manifesto, it is officially opposed to the ILP system. Long time Congress ally the Nationalist Congress Party (NCP) is also opposed to ILP. However, CM Okram Ibobi Singh, a member of the Congress party, has supported the ILP and asked the BJP-led Modi government to implement it. Thus, even within political parties there seem to be differences on the ILP. Meanwhile, agitations and curfews continue, life in the region comes to a standstill and lives are lost in the pursuit of the ILP issue.